Austrian actor; born July 18, 1849, at Bochnia, Austria. 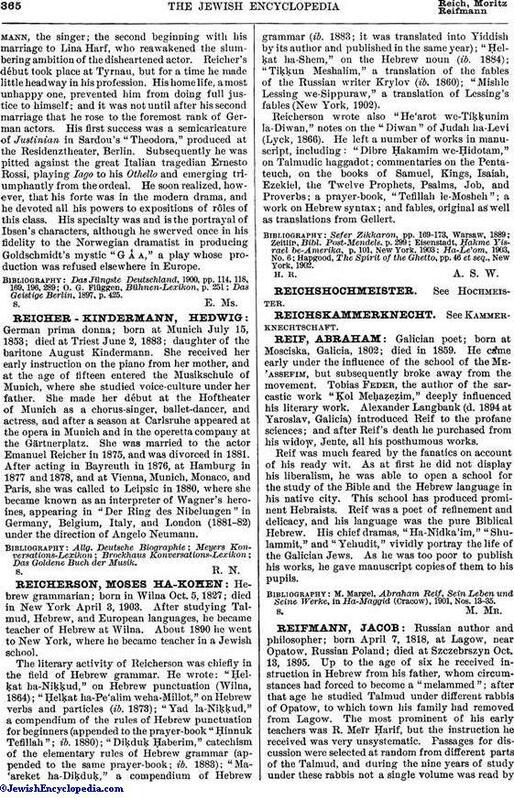 Reicher's theatrical life is divided into two periods: the first ending with his separation from and the subsequent death of his first wife, Hedwig Reicher-Kindermann,the singer; the second beginning with his marriage to Lina Harf, who reawakened the slumbering ambition of the disheartened actor. Reicher's début took place at Tyrnau, but for a time he made little headway in his profession. His home life, a most unhappy one, prevented him from doing full justice to himself; and it was not until after his second marriage that he rose to the foremost rank of German actors. His first success was a semicaricature of Justinian in Sardou's "Theodora," produced at the Residenztheater, Berlin. Subsequently he was pitted against the great Italian tragedian Ernesto Rossi, playing Iago to his Othello and emerging triumphantly from the ordeal. He soon realized, however, that his forte was in the modern drama, and he devoted all his powers to expositions of rôles of this class. His specialty was and is the portrayal of Ibsen's characters, although he swerved once in his fidelity to the Norwegian dramatist in producing Goldschmidt's mystic "G Ἁ A," a play whose production was refused elsewhere in Europe. 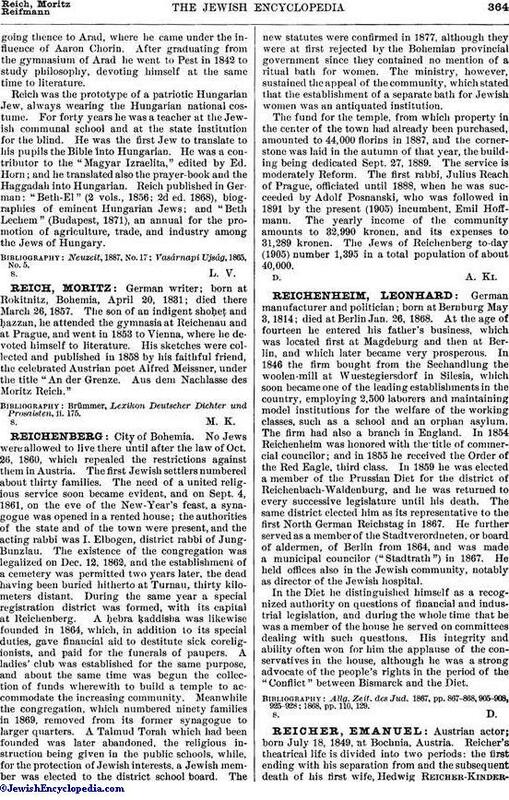 Das Geistige Berlin, 1897, p. 425.